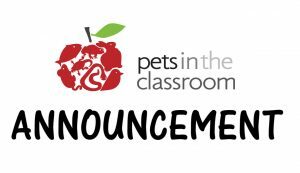 We are please to announce that the Pets in the Classroom grant program, which has previously been available to Pre-Kindergarten through 8th grade teachers, will be expanding its reach. For the first time, teachers in 9th grade classrooms will also be eligible to apply!. Beginning August 1st, grants will be available to Pre-Kindergarten through 9th grade teachers in both private and public schools who desire to introduce a pet into the classroom or already have a pet in the classroom with funding toward a small animal or for pet supplies. We hope to accommodate other high school grades in the future, but are trying to work within our budget limitations and grow at a sustainable pace.